Home » Is Brand Storytelling the Ultimate Weapon? Is Brand Storytelling the Ultimate Weapon? 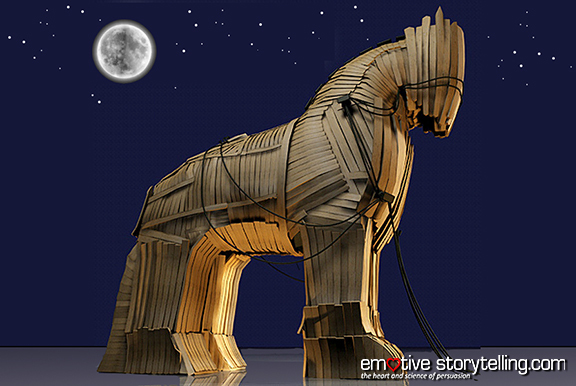 Much like a trojan horse, a story can penetrate into the fortified citadel of the human mind. This is simple truth so I’ll get right to it. People are moved by emotion. Emotion trumps reason. There is no better way to engage and emotionally connect other people to your mission than through the power of storytelling. This applies whether you are in Pentagon, boardroom, break room, waiting room or living room. After decades of seeing ever diminishing returns from saturating customers, stakeholders, employees, patients and everyday consumers with data dumps, PowerPoint slides, fact and spec sheets, and more recently, infographics, organizations are realizing they are losing the battle of engagement. That reality is being felt in terms of lost mindshare and marketshare. Finally, business, agencies and organizations are starting to pay attention. Without user engagement and a compelling story, it is obvious that “our product, idea, or personal brand, is dead on arrival” says Jonathan Gottschall, author of The Storytelling Animal: How Stories Make Us Human. Gottschall joins many other writers such as Annette Simmons and Stephen Denning, saying science validates the long-held belief that story is the most powerful means of communicating a message. This matters because we now live in a story economy. Brand storytelling is no longer a nice-to-have. It’s a necessary part of a successful integrated digital marketing approach for driving engagement, awareness, and ultimately revenue. And it may be the best way to tap into the rapidly accelerating potential and power of social media marketing. Stories rule! But then, they always have. I’m a digital storyteller who uses neuroscience and cinematic technique to harness the resonance of story in human life. I have focused on bringing story-based relevance and relatedness to brands, services, concepts and technology. I have found first hand that people and organizations are transformed by stories. And this is true whether it is a congressional subcommittee, group of hardened combat veterans, C-suite executives, brainy scientists or pedantic researchers. Our human nature compels us to be moved by the power of story regardless of cognitive ability, professional achievement or station in life. This is because we are all at heart, emotional creatures. A story’s persuasive effects have been validated, and the evidence is growing. Over recent decades psychology has begun a serious study of how story affects the human mind. You may find it surprising to discover that fiction seems to be far more effective at changing beliefs. People don’t argue with stories like they do with facts, evidence and reason. It has been shown that attitudes, fears, hopes, and values are strongly influenced by story. Stories suspend disbelief and silence the skeptics. Stories open us up for change. Psychologists Melanie Green and Tim Brock posture from their studies that entering fictional worlds “radically alters the way information is processed.” Green and Brock’s studies shows that the more people are transported into a story, the more the story changes them. They state that “highly absorbed” viewers also detected significantly fewer “false notes” in stories–inaccuracies, missteps–than less transported viewers. In other words, a compelling story goes along way to bring people to consider your point of view and be less resistant to false notes and points of contention. As a seasoned practitioner of storytelling with Visual Eyes Inc., I have arrived through years of experience at the same conclusions that science has reached through experiment. Yet it is the optimistic power of story to persuade that is really the emphasis of Guber’s point in referencing the Trojan Horse. He is aware that story is a tool that can be used for good or ill as the bloody metaphor suggests. “Like fire, it can be used to warm a city or to burn it down.” Both Guber and Gottschall understand this, but emphasize a story’s ability to bring on change for the better. I strongly agree. Whereas the Trojan Horse was the ultimate weapon, I believe storytelling is the ultimate answer. My belief from decades of observation is that it is “people that move people to change.” It isn’t facts, business cases, fear tactics or technology. Important as rational considerations and intimidation are, they don’t move people are as much as you think. Emotive stories are about people, their feelings and their connectedness. This is why they are the answer many of us have been looking for. The new science of emotive storytelling is relevant to us all. As humans, we may think that our wisdom, intelligence — really sets our species apart. Gottschall reinforces this saying “and when we think we can best persuade with dispassionate presentation of costs and benefits, we are implicitly endorsing this view. But we are beasts of emotion more than logic.” Well said. That gets to the heart of it. Emotion is at the core of change. Even more than saying storytelling shape us, it defines us. It enables us to have a genuine dialogue with each other and with our customers and patients. And because the quality of that narrative interaction matters to us, it is essential to make storytelling an important part of our business and day-to-day interactions. The quality of one’s storytelling aids the journey through life. In fact, stories might be the difference and the answer that moves you and customers to action.